Jane has received her handmade-of-the-month for July. I sent it off last week and then completely forgot to blog it. 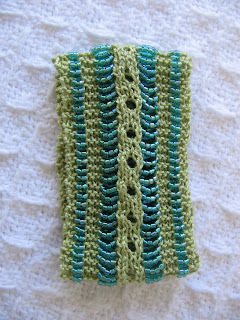 I made MaryElla, a bracelet pattern from knitty.com. I tweaked the pattern a little, instead of overlapping the ends and sewing on a snap, I used a provisional cast on, shortened the overall pattern and stitched the two ends closed with kitchener stitch. I've made this pattern for myself a few times, but always found the overlapped ends a bit lumpy. The provisional cast on and kitchener stitch close made for a cleaner overall look. I also made the bracelet tiny, less than 6 inches. It barely fit me (or Ian), but it fits Jane perfectly (it even spins on her wrist). 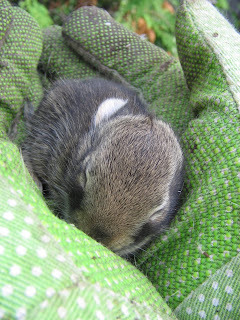 In bunny news, I'm afraid another one died overnight. 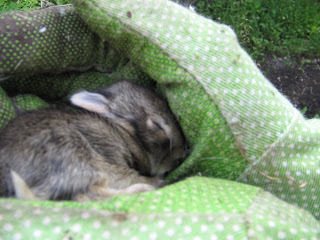 I'm not sure what the mortality rate is among wild rabbits, but I wouldn't be surprised if this sort of thing happens. 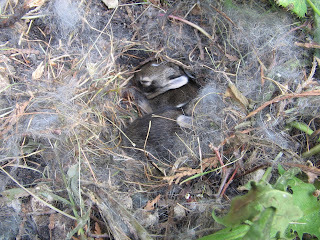 I removed the dead baby from the nest and found there were still three left. One must have been hiding under the others yesterday. They look bigger even after one day. Here's Elly holding one of them. They wriggle quite a lot, and are about the size of a full grown hamster. Their eyes and ears are still closed. Oh, how sweet! I read it to mom and she squeled when you took it out of the nest! The poor little thing. 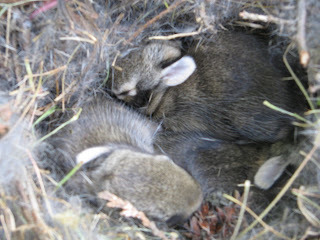 I squealed about taking out the dead one.... the live ones are looking very adorable. 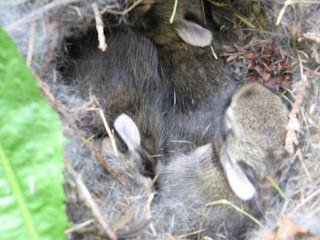 At their current rate of growth, I reckon that we'll have enough for rabbit cacciatore by the weekend. (Although, the braised rabbit with strawberry mint sauce sounds pretty good as well.) I was hoping (hopping?) that Uncle Ian could recommend a wine that compliments rabbit. Any ideas? Hmmmmmm... a wine to complement rabbit cacciatore or braised rabbit.... well it has to be French Rabbit wine of course... http://www.frenchrabbit.ca ...as long as they are french rabbits that is. Perhaps they migrated from St-Boniface? BTW, very cute bunnies. I bet they will be very tasty indeed!